Inventory We are a resale marketplace, not a box office or venue. Ticket prices may exceed face value. This site is not owned by North Island Credit Union Amphitheatre . North Island Credit Union Amphitheater formerly the, Mattress Firm, Sleep Train and Cricket Wireless Amphitheatre Chula Vista, is the largest concert seating venue in the local San Diego, California area. The North Island Credit Union Amphitheater opened as the Coors Amphitheatre on July 21, 1998. North Island Credit Union Amphitheatre box office had its first sellout a month after opening for a Spice Girls concert. North Island Credit Union Amphitheatre tickets provide 9,468 chair back seats and an additional 10,024 lawn seats. 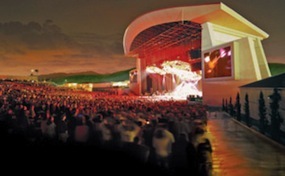 Most of the premier concerts in the summer pass through the North Island Credit Union Amphitheatre in Chula Vista. AmphitheatreChulaVista.com is not affiliated with any primary box office or official supplier. We proudly offer low prices and a large selection online of all secondary market inventory. Prices may be above or below face value. To purchase tickets for any North Island Credit Union Amphitheatre events please call our operators or simply click on the event you would like to attend and pick from our vast array of tickets.